The house, as it looked when we bought it. A lot of house for the money, but also a massive renovation project. Leaving England for the first time as expats. We never imagined we would be away for 25 years. 18 months later, gutted and reassembled, just awaiting a top coat of paint. We've been wandering for twenty-five years now. From time to time we've stayed put in a particular place, to renovate a house or to explore an area in depth, but even then we travelled around. So many people ask us why we adopted the nomadic life and there's no easy answer to that. It's just what we do. Traveling the world without a plan. That just about sums up our thinking when we left England. Madness to leave ‘proper’ jobs, friends and family to go wandering without any form of income whatsoever? Maybe. Certainly that was the general tone of those who expressed an opinion. We’d thought often enough about doing something or other like this, but even so it took a random glance at a newspaper advert to set things in motion. 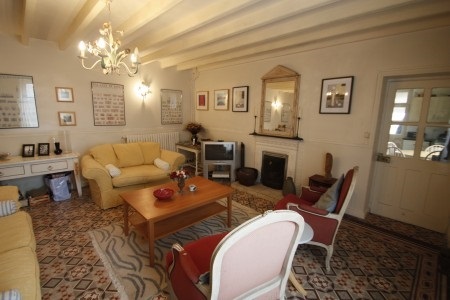 'French house are cheap, aren't they?’ I said, already thinking twenty steps ahead of that one sentence. G did all the sensible stuff, the research, and we started looking properly. At first we thought we'd bum around the world for a few years, but first we'd buy a ‘project’ house to work on now and again and provide us with a base. 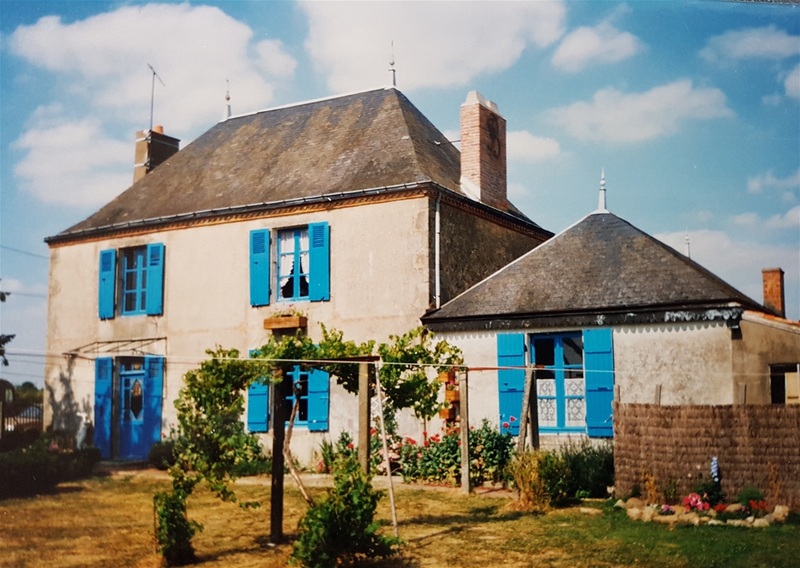 We eventually bought the perfect project: a huge but run down Maison de maitre in the Loire Valley, but after buying it and moving our furniture over to France, the sale of our house in England fell through two days before completion. That meant we had no money to speak of, no income at all and were faced with going to a country where we didn't speak the language intending to take on a massive rebuild project with no real building skills and no money to pay anyone else to do the work. Only one thing to do and we did it. Filled the car with clothes, two cats and a dog and set off anyway. Here’s why we picked the house we did. Many years ago, in our first year in France, we wrote a cookery book. I did the recipes and G wrote about our various mad exploits where food played its part. Only one copy survives and that I found in a secondhand bookshop in Kent about ten years ago. When we wrote it, I persuaded G to keep it simple, ‘dumbing down’ as he put it, and this is how he described our first sight of the house we were to live in for almost five years. Dumbing down for G isn't easy - he's a proper writer after all - but after the introduction bit, with all that Latin and French malarkey, he calms down. He's upgraded my name to Marigold, but otherwise it's as written twenty-five years ago. 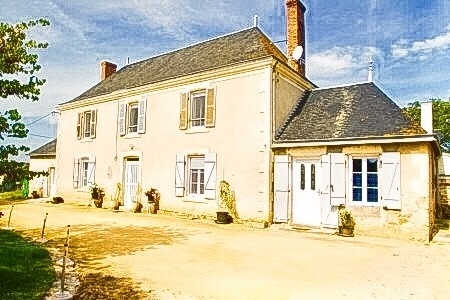 First House in France. A lot of house for the money. Marigold’s oft repeated views on Shakespeare are well known. Hint: not exactly a ringing endorsement, but this quote from Hamlet sums up the process we went through. As our destination was to be France, where best to start than with Je pense, donc je suis an expression used by Rene Descartes, presumably as a watered-down version of cogito ergo sum to avoid frightening those for whom Latin is a no go area. Whatever, it amounts to the same declaration: I think, therefore I am. I rationalise. I think situations through. I think, therefore I am is in my DNA. Marigold has ideas. It's a good blend of skills, a good system. Marigold always says she has ‘crap ideas’ and who am I to argue, but her distinctly non-linear approach works very well on occasions. That's an immutable fact and this was to be one of those occasions. ‘And Thus the native Hue of resolution Is sicklied o'er with the pale cast of thought’. Too much planning removes spontaneity and without scope for acting on impulse nobody never achieved anything of note. Sometimes it's best to stop thinking and simply act on what turned out to be an excellent idea, namely ‘let's go to France.’ So that's what we did. In pre-Internet times, searching for a house to buy was much more complicated. 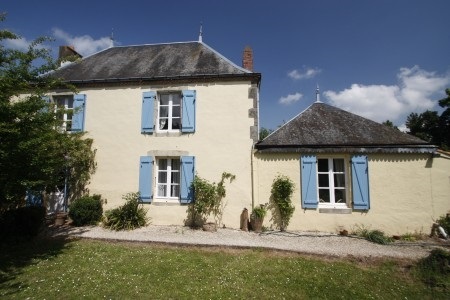 After trawling through magazines and newspaper advertisements and making numerous telephone calls to French estate agents, we found a house that, according to its (badly) written description appeared to offer a great deal and yet remain within our budget. We had enough put by to buy a house and at least make a start on its renovation. We had a house to sell in England and this would fund the completion of the project and allow us to travel wherever the mood took us as well. All we needed now was to find the perfect house and the one we were about to visit appeared rich with promise. 'A lot of house for the money,' as Marigold put it. The approach was by a narrow road through fields of tournesols, a glorious mass of brilliant sunflowers at every stage of their all-too-brief life, from riotously golden flaming yellow to the wilting stems and drooping heads of their eventual decline, the colour of burnt chocolate, their desiccated seeds awaiting the mighty harvesting machines. The main house, viewed from the road, was impressively solid, weathered by a hundred or so hot summers to a rich blend of honey and terracotta. Facing south, the shutters on the main door and four windows were bleached of any discernible colour, gloriously distressed by time and climate and great swathes of lavender, rosemary and thyme under the windows. A stone barn, rambling and massive, ivy-covered to such an extent that the huge arched doors were partially obscured, stood at a right-angle to the house forming a barrier to the road. When the owner came to meet us at the gate, we were somewhat disconcerted as, at first glance, he appeared to be naked. On closer inspection we saw that he was wearing only a pair of wellington boots and ancient swimming trunks, very brief and pale orange in colour. Although seemingly in his mid-sixties, he looked very fit indeed, bronzed to a deep mahogany and carrying a quite ferocious scythe over one muscular shoulder. We shook his calloused and grubby hand – he had the grip of a bear – and made introductions. ‘Maurice’ talked at a ferocious pace, spitting out words as if from a machine gun, and not appearing at all concerned that we did not, apart from the odd word, understand him at all. He told us, I think, that the house had been built by his great-grandfather, a hundred or so years previously, and that the family had lived there since that time. It was with obvious reluctance that he was now obliged to leave. The house had been empty for almost a year, but he had been visiting almost every day to look after the garden. Maurice’s fondness for ribald gossip, and his insatiable curiosity concerning les Anglais, delayed matters to such an extent, with many gestures and waving of arms on both sides, that it was a good half-hour after our arrival before, at last, we entered the house. The dark entrance hall led into a large kitchen with a magnificent granite fireplace. The tiled floor was chipped and uneven, but shone with a rich patina imparted by great age and generations of passing feet. Maurice swung the large oak shutters apart and the sunlight streamed in through a venerable half-glazed kitchen door. Cobwebs hung from the ceiling, and a thick layer of dust covered every exposed surface, but we hardly noticed. We stood in the centre of the room, gazing about in wonder. All of the original features were intact. Wonderfully solid dark oak beams on the ceiling. A large porcelain sink with two ancient taps sticking straight out from the wall, positioned under a window with views to the garden, the possibilities were endless. I looked across at Marigold. She raised her eyebrows and I knew she felt the same as me. ‘La cuisine’, said Maurice, wiping a thick coat of dust from the edge of the sink with a stubby finger. Maurice opened a magnificent blackened oak door at the far end and led the way into a large room, perhaps eight metres square, totally empty of furniture which made it appear even larger. The original tiles covering the floor would not have been out-of-place in a palace! Discreetly patterned in grey, white and maroon, virtually un-marked and absolutely beautiful. We passed through, entering a further room dominated by an immense bread-oven. In times past, Maurice told me, this house used to make bread for the local villages, and the oven remained in perfect working order. 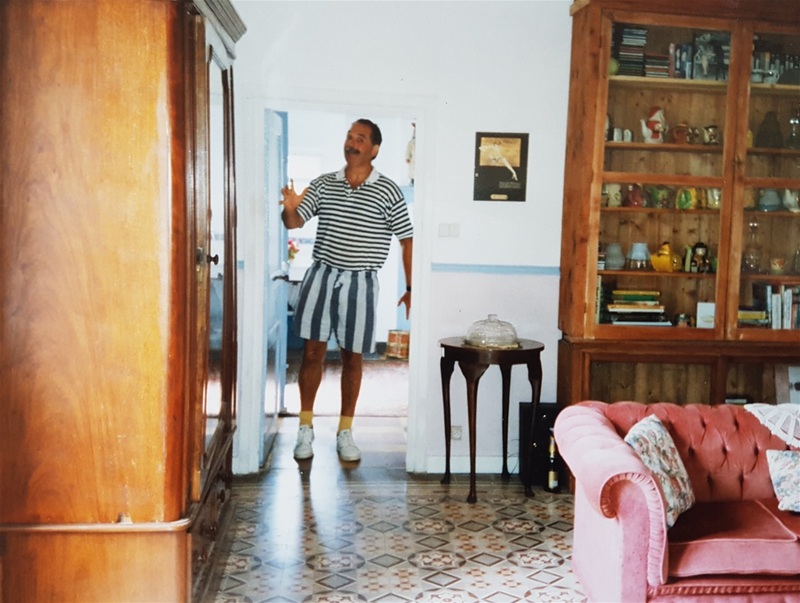 Upstairs were three huge bedrooms and a separate stairway led to an enormous grenier, extending the entire length of the house and I was instantly aware of the possibility to expand this into at least a further two bedrooms. Below the grenier was a room used by Maurice as a workshop, fitted out with a saw-bench and lathe, together with all his tools and other paraphernalia. Maurice indicated a door at the far end of the workshop. Chuckling away to himself, he motioned me to enter. I opened the door, walked down three steps, and entered a room for which nothing could have prepared me. This was the heart of a French farmhouse, the cave, or wine store. Wooden racks filled with bottles lined three of the walls. The fourth wall consisted of two stone tanks side-by-side, each capable of holding many thousands of litres of wine. In the centre of the room was a huge ancient winepress, and half a dozen oak casks. ‘Formidable, oui?’ Maurice asked, his voice lowered respectfully, as if in a cathedral. The analogy was appropriate; this was a place devoted to the worship of Bacchus, the god of wine. I nodded my head in agreement, momentarily speech-less. Maurice understood and gripped my arm tightly as if recognising a kindred spirit. I looked at the hundreds of bottles lining the walls and indicated my admiration. Maurice roared with laughter, selecting a couple of bottles for us to drink after we had finished looking over the property. The jovial Maurice led the way across the field to a huge building, even larger than the house, with double doors high enough to admit a double-decker ‘bus, the pale washed-out blue of convolvulus clinging to the stone walls. When the doors were opened, we saw that the barn would easily accommodate a whole fleet of double-decker ‘buses. ‘Magnifique’, indeed. The roof towered 40 feet over our heads, supported by immense oak beams, the rafters joined by wooden pegs in the traditional manner. A platform, piled high with straw bales, extended over half the barn, with yet more oak casks, dozens of them, stacked under the platform. 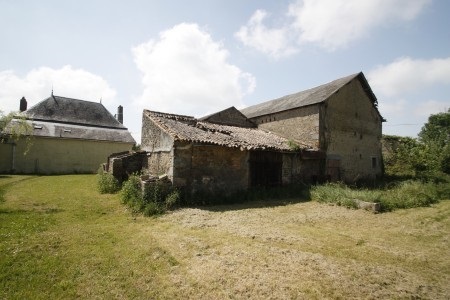 At the rear of the barn, through another pair of doors, were two stables, complete with mangers and rough-hewn granite sinks and feeding troughs. 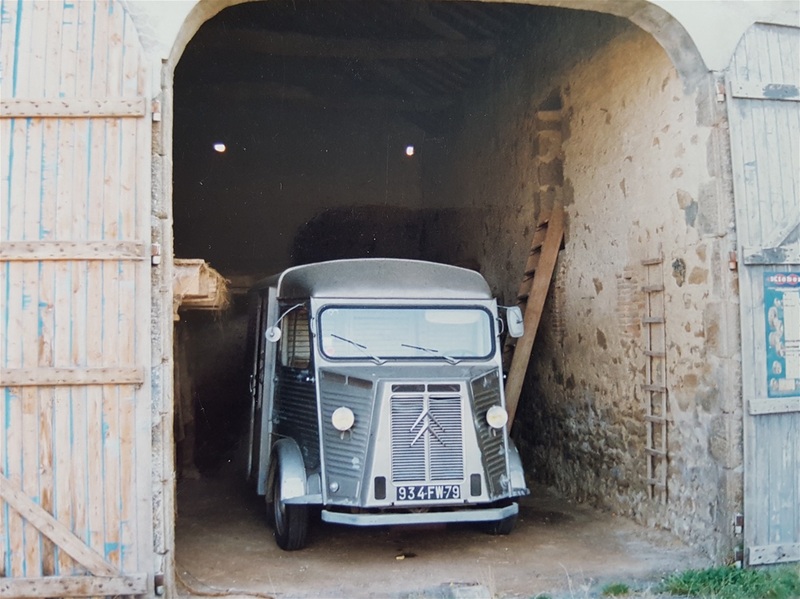 A further barn contained a venerable tractor and an ancient Citroën van, fitted out as a cattle truck, its exhaust held together with flattened-out tin cans and copious lengths of baling wire. 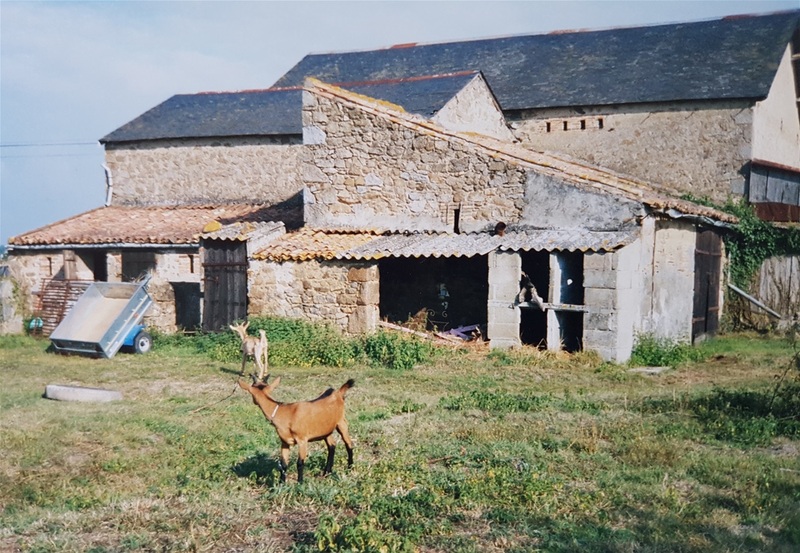 Further along, two open-fronted barns, and a range of outbuildings, the smallest of which would garage at least three cars. Underfoot were great drifts of wild mint, spreading un-checked and at will, together with nodding purple-headed chives running riot amongst clover and meadow grass, each step marked by a lingering trail of scent. The views from the rear were, if anything, even better than the frontal approach. In front of the beech hedge, a patch of un-cultivated land filled with flowering thyme, rosemary and gorse. Beyond, open fields led the eye to a small hill, an incandescent riot of broom and myrtle amongst random clumps of purple and white iris, their delicate stems and flower heads fluttering in the faint breeze. I made a mental note about the need to buy a scythe as the grassed area was both vast and unkempt. Our initial impression that it was, ‘A lot of house for the money’, now appeared the under-statement of the century. This was just what we wanted and the price was right, well within our budget. We must own this house! 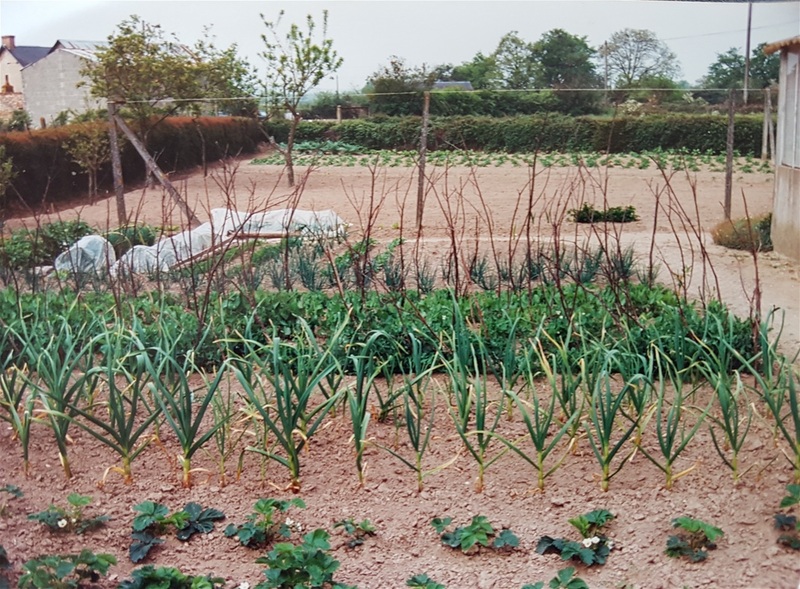 Part of our one and only, ever, successful vegetable garden, doomed to return to nature inside two years.